Rotating rear camera for front selfie is nothing new, if you are familiar with Oppo N1 smartphone which was launched back in 2013. 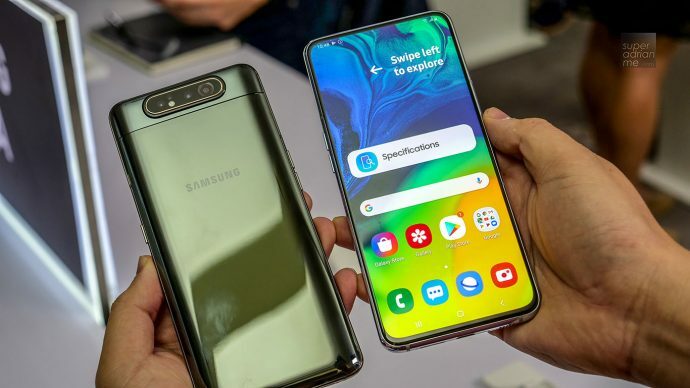 However, Samsung has upped their game by giving the new Samsung Galaxy A80 a Triple Camera System that rotates to the front, so that you will get the best bokeh for your portrait selfie and ultra wide angle for your group wefie. Nobody will be left out in your selfie with the all new Samsung Galaxy A80. When you select the selfie mode in the camera app, the three cameras automatically pop-up from the back of the phone and rotate. The innovative camera mechanism delivers the same extraordinary triple camera experience with the same high-resolution lens, front and rear. With the 48 megapixel F2.0 main camera, you will be able to shoot vivid images day and night. The Galaxy A80’s 3D Depth camera offers Live Focus videos by scanning objects for measurement and depth. Built with an 8 megapixel F2.2 Ultra Wide angle lens at 123°, now you can capture more dramatic shots on your smartphone. The camera’s flaw detection system is also able to warn you when eyes are closed or if the photo is blurred from a shaky shot. So now you can reduce blur or ruined images and take another one. 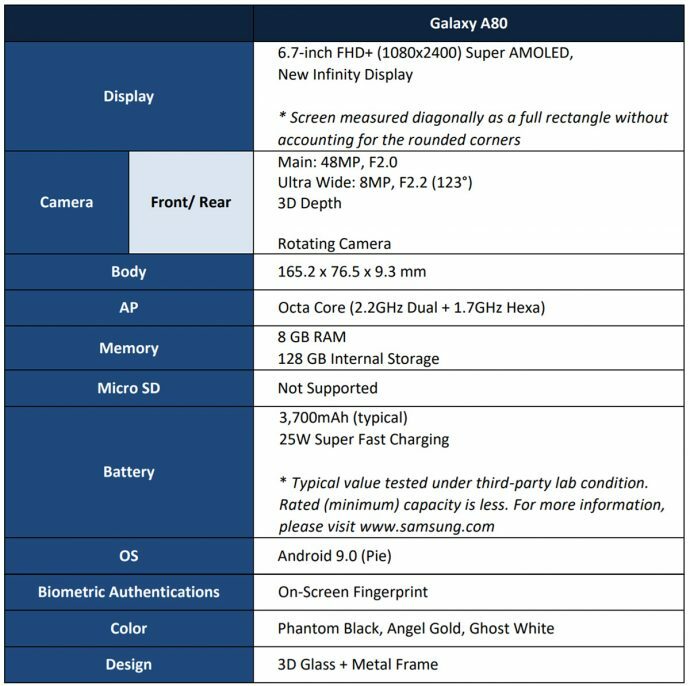 The Galaxy A80 will also be featuring Samsung’s first New Infinity Display. 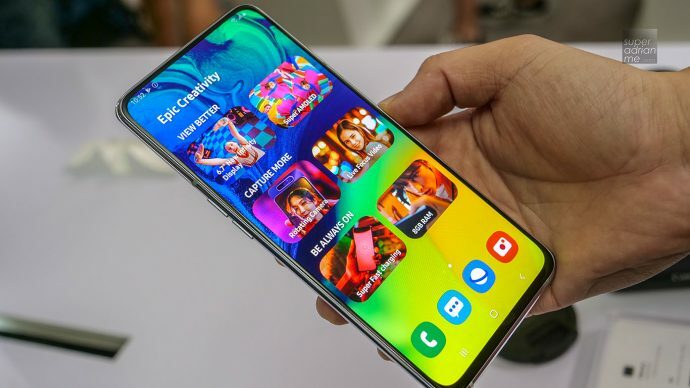 6.7″ edge-to-edge with no Notch or no Hole Punch to house the front camera, now you can have an uninhibited view while using the Galaxy A80 for multimedia experience on this new FHD+ Super AMOLED display. When using earphones or Bluetooth speakers, you will have a 360-degree audio experience to get you fully immersed in every game, video, photo and story. The Galaxy A80’s 3,700mAh battery and its Super-Fast Charging at 25W capabilities keep you connected for longer and gives you more freedom by allowing you to charge you phone quickly – so you don’t miss a beat. Like it’s “big brothers”, the Galaxy S10 and S10+, the Galaxy A80 will also feature On-Screen Fingerprint sensor to unlock you phone. The Galaxy A80 will be available in three colours: Angel Gold, Ghost White and Phantom Black. The Angel Gold colour includes elements of pink, while the Ghost White option combines some blue characteristics, so these colors look different depending on light direction and reflection. 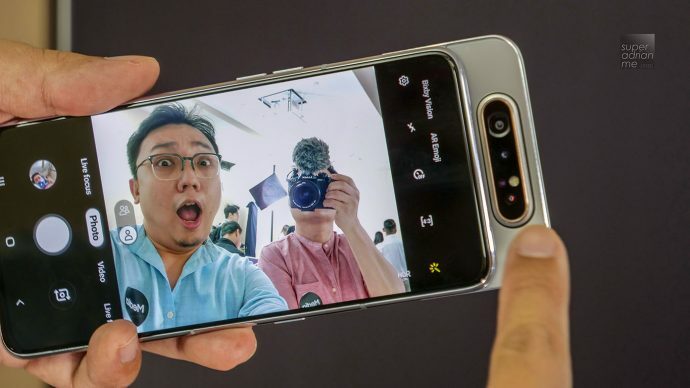 The Samsung Galaxy A80 will be available in Singapore in quarter 2, 2019. Pricing will be announced at a later date.